The beverage industry is committed to make it easier for consumers to choose a beverage that’s right for them. We are offering an increasing list of low-and-no-calorie beverage choices as well as mid-calories options and providing consumers with easy-to-read nutrition labels. With our Balance Calories Initiative, we are transforming the beverage landscape in communities nationwide. This initiative will take our efforts to provide consumers with more choices, smaller portions and fewer calories to an ambitious new level. The Balance Calories Initiative is the single-largest voluntary effort by an industry to help fight obesity. Working with the Alliance for a Healthier Generation, America’s leading beverage companies have set a goal to reduce beverage calories consumed per person nationally by 20 percent by 2025. To help achieve this goal, the beverage companies will engage in national and community efforts. The beverage industry started the Clear on Calories initiative launched in conjunction with First Lady Michelle Obama’s “Let’s Move!” program to increase the transparency of our products by adding new, easy to understand labels to the front of every can, bottle and pack we produce. 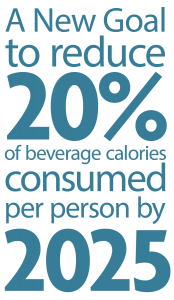 By displaying the total calories per container on beverages 20 ounces or smaller, Clear on Calories builds upon the industry’s on-going efforts to help people make informed choices for themselves and their families. A uniform calorie label on beverages makes it easy for customers to choose the beverage right for them. You can learn more about our other national programs at ameribev.org/. For more information about how consumers are benefiting from more choices and innovation, visit deliveringchoices.org.